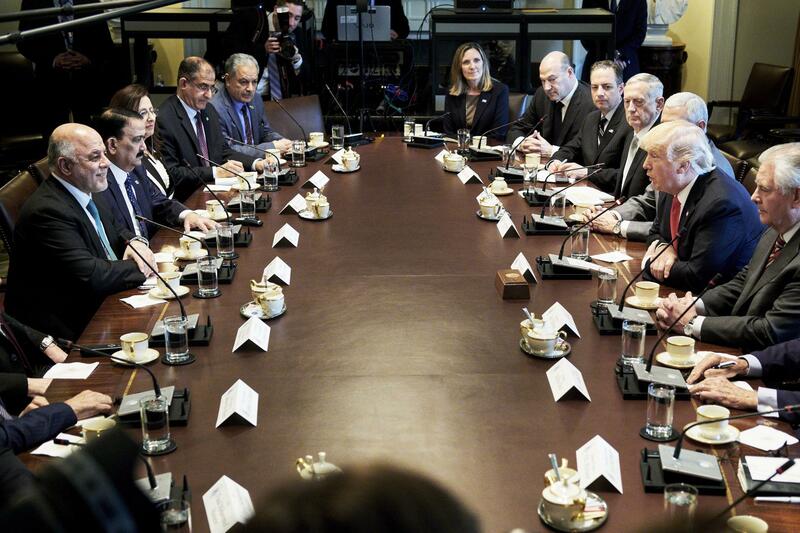 President Donald Trump, with members of his Cabinet, met with Iraqi Prime Minister Haider al-Abadi ( left) in the Cabinet Room of the White House. Trump promised to ‘drain the swamp.’ So what’s happening with his Cabinet? WASHINGTON — The refrain began on the campaign trail in 2015 and has since become synonymous with President Trump’s over-the-top brand of political rhetoric. But nearly 15 months into his administration, Trump’s bid to surround himself with top-quality associates has devolved into constant controversy and scandal. The merry-go-round of West Wing aides has captured national headlines, but Trump’s handpicked presidential Cabinet has also been mired in constant allegations of impropriety. Environmental Protection Agency administrator Scott Pruitt is currently under fire for multiple controversies including allegations that he rented an apartment at a cut-rate price from a lobbyist in Washington and that he spent public funds on a 24-hour security detail during private trips to Disney World and the Rose Bowl. 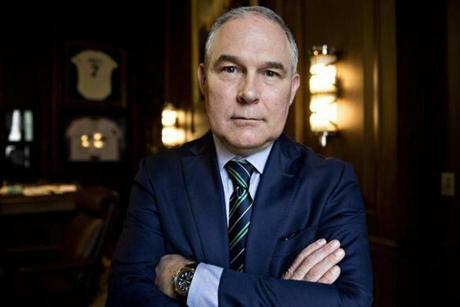 The Government Accountability Office said Monday the EPA violated federal spending laws when it bought Pruitt a $43,000 privacy phone booth for his office. In the last month, Veterans Affairs Secretary David Shulkin was forced out after he used taxpayer dollars to fund a 2017 European trip with his wife, and Ben Carson, who runs the Department of Housing and Urban Development, incurred Trump’s ire for spending $31,000 of taxpayer money on a ornate dining set for his office. 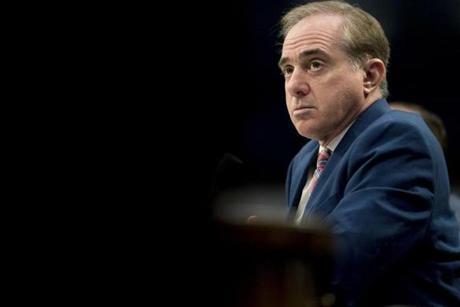 Former Veterans Affairs Secretary David Shulkin. 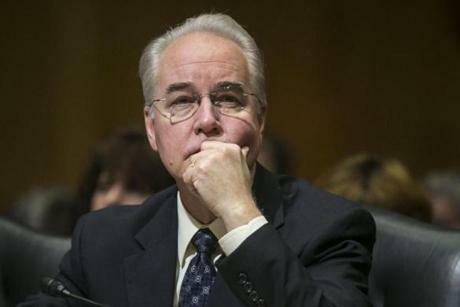 The former secretary of Health and Human Services, Tom Price, resigned in September after news broke that he was extensively using taxpayer money to purchase chartered flights. “The Trump Cabinet is to a normal Cabinet the way the Addams Family was to a real family. It’s a mockery of the norm,” said Senator Sheldon Whitehouse, a Democrat from Rhode Island. Whitehouse was the first lawmaker to draw attention to Pruitt’s unusual use of his security detail. In a sign of the growing cloud around Trump’s Cabinet, even some Republicans are now saying the rash of scandals has reached eye-popping levels. Trump himself acknowledged Monday he made some poor Cabinet picks, although he has stuck by Pruitt so far. “Not all of my choices were good,’’ he said in Miami, while praising two he called “great,’’ Labor Secretary Alex Acosta and Treasury Secretary Steve Mnuchin. In the case of Pruitt, former New Jersey governor Chris Christie, Maine Senator Susan Collins, — who voted against Pruitt’s confirmation — and three House Republicans have all publicly said they don’t believe the former Oklahoma lawmaker has the integrity to lead the EPA. David J. Apol, the federal government’s top ethics official and Trump’s acting director of the Office of Government Ethics, wrote the EPA a letter on Monday raising questions about Pruitt’s actions. Other presidents have certainly had high-level officials become wrapped up in ethics controversies. But with Trump, the scandals occur more frequently and lead to more staff turnover, according to data tracked by the nonpartisan Brookings Institution. For example, several officials left or switched jobs within the first year of the administration — including Price, former chief of staff Reince Priebus, and homeland security chief John Kelly, who now serves as chief of staff. Former Health and Human Services Tom Price. Washington ethics lawyers believe Trump’s early series of controversial ethical decisions — including refusing to release his tax returns, not divesting ownership of his global company, and using taxpayer dollars for constant trips to his golf courses — has empowered other members of government to shun normal codes of conduct. Noble added another reminder: Trump had no political experience before entering the White House. The same is also true for some members of his Cabinet, including Carson, and Noble said he believes some of the current problems stem less from malice and more from ignorance. “They tend to still view things from the perspective of a CEO of a family-owned company,” Noble said. The White House did not respond to a request for comment. Earlier this month, as the White House dealt with more questions about unseemly behavior from a Cabinet official — mainly Pruitt’s sweetheart condo deal — Trump surrogates refused to offer the EPA administrator their unequivocal support, which political insiders viewed as a bad sign for Pruitt. Republican senators, however, have mounted a pro-Pruitt public relations assault. On Twitter — the president’s favorite social media platform — multiple prominent conservative lawmakers made the public case for Pruitt to stay in his current job. Pruitt has amassed good will from many conservatives for rolling back several of former president Obama’s regulations regarding climate change and natural resources. Senator Ted Cruz, a Texas Republican, also offered his support. “Why do Obama and his media cronies want so badly to drive @EPAScottPruitt out of office? @realDonaldTrump is too cagey to be duped and bullied by the Obama groupies,” Cruz said. More bad news regarding Pruitt continued. News outlets reported this month that Pruitt had a member of his security detail reassigned because the officer told Pruitt he could not use his emergency sirens to bypass traffic. Another story said he gave certain top aides significant raises without the White House’s consent. “I’ve never seen anything like this,” said Richard Painter, the Republican ethics lawyer under former president George W. Bush. The scandals also threaten to fuel further disconnect between the Trump administration and congressional Republicans, political observers said. In what’s already been deemed a bad political environment for Republicans, the president keeps firing Cabinet members, and therefore throwing tough Cabinet confirmations onto the already-crowded plate for lawmakers. Trump has made three additional Cabinet-level changes in the early stages of his second year in office, removing Shulkin and replacing Secretary of State Rex Tillerson with former CIA chief Mike Pompeo. According to Brookings, the changes now mean Trump is fast approaching the total Cabinet turnover that Obama had during eight years in office. He has already surpassed George W. Bush’s total.